Tip 2 – Think waterproof– The goal with shower bases is to make them waterproof to keep your subfloor and floors below safe and free from water. 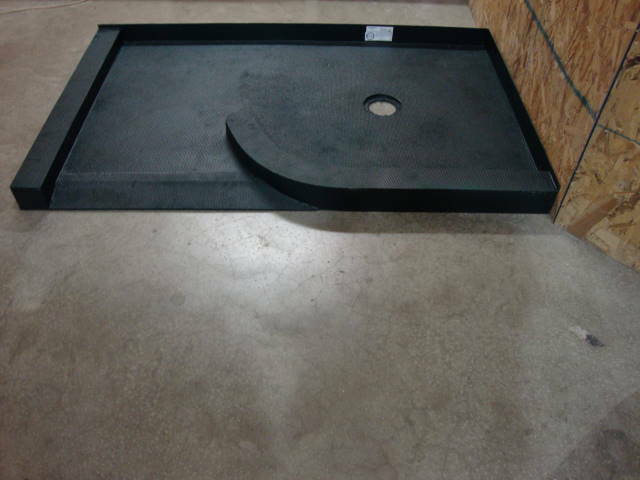 Choosing pre-manufactured bases (expanded polystyrene, cultured marble, solid surface) can be safest because they are waterproof out of the box. Bases made at the project site (mud set and extruded polystyrene) can be waterproof as well – but you need to make sure you (or your contractor) does the job right the first time. Tip 3 – Project location can change your selection – Big, heavy one piece bases (like cultured marble and Corian) may be able to be moved into second floor bathrooms. For tough to reach bathroom remodeling projects choose site built (mud set, extruded polystyrene) or light weight manufactured systems (expanded polystyrene base). Tip 4 – Determine your preferred shower floor covering – For solid surface bases the base is the floor so nothing else needs to be done. For expanded/extruded polystyrene and mud set bases you’ll need to tile over the base structure. If you’re worried about the pain of maintaining tile grout joints use urethane grout for drastically reduce maintenance. Tip 5 – Build today while thinking about tomorrow – Let’s face it with the real estate environment today people are staying in their homes longer. So if you’re redoing your shower you want it to last – but health conditions, physical needs and who(m) may be using the shower over the life of your home may change (maybe an aging relative may need to stay with you or someone in the family may get hurt). The good news is you can build a universal design contemporary shower which can work just as well as you get older if you use a barrier free shower base. Tip 6 – Plan with your budget in mind – The cheapest base is a mud set, but it also has the highest failure rate. 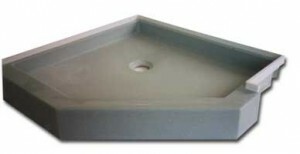 For a waterproof solution at a middle of the road price consider an expanded polystyrene base or cultured marble. The highest priced base would be a solid surface type. If you have any experience you’d like to share or would like to learn more about choosing a shower base please comment below. Learn more about custom shower bases by visiting Columbus Glass Block (614-252-5888) , Cleveland Glass Block (216-531-6363), Mid America Glass Block (513-742-5900) of Cincinnati or Dayton, Eastern Glass Block of New York and New Jersey, and Cleveland Design and Remodeling (216-531-6085) or Columbus Design and Remodeling (614-252-7294).